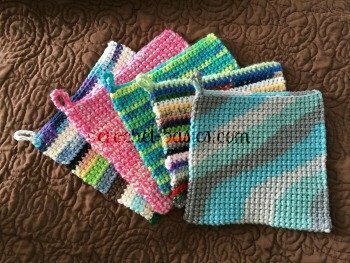 I love crochet coasters! They save your tables and look great! This pattern is a fun, quick way to practice crocheting in rounds and changing your yarn color, too. When changing colors while crocheting rounds, you'll usually fasten off one color after the round is complete. Then you'll start the new color when you start the new round. This gives your rounds a much cleaner finish. 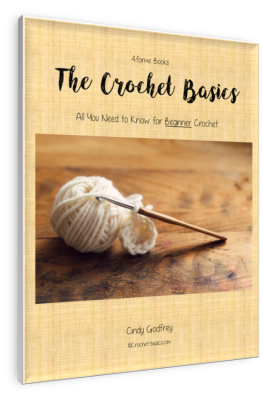 Let's get started on how to crochet a coaster. I used three different colors but you could use more or less colors if you want. You could even just keep it all the same color. It's all up to you. Choose whichever colors you like, but to make it easier and uniform choose three colors of the same type of yarn. I like to use a cotton yarn when making coasters. They tend to absorb the condensation quicker and after all, the coasters do have a job to do. With color A ch (chain) 5 and join with a slip stitch into a ring. In the third sc from your slip stitch, pull up a loop with color B.
Dc (double crochet) in the same sc as the join. Work 2 dc in the next sc stitch. Continue 2 dc in each stitch from the previous round until complete. In the third dc from your slip stitch bring up a loop of color C.
Hdc (half double crochet) in each dc of the previous row. In the third hdc from your ss pull up a loop of color A.
Sc in the same hdc stitch that you joined in. Work 2 sc into the next stitch. Work 2 sc in each hdc stitch of previous round. In the third sc from ss pull up a loop of color B.
Sc in each sc stitch of previous round. In the third sc from ss pull up a loop of color C.
*Skip 2 sc in the previous round. Sc in third single crochet stitch. Repeat from * to * (steps 3 and 4) 15 times. Ss in the beginning second chain in the original chain of the row. You did it! Now you have your first crochet coaster! Now just make a few more for a set. 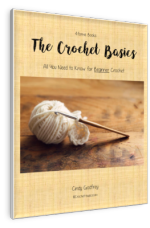 Learning how to crochet a circle will help you in so many projects. Keep practicing it until you feel completely comfortable with this technique.